Want to celebrate with an extra special someone without spending a lot of money or extra time? 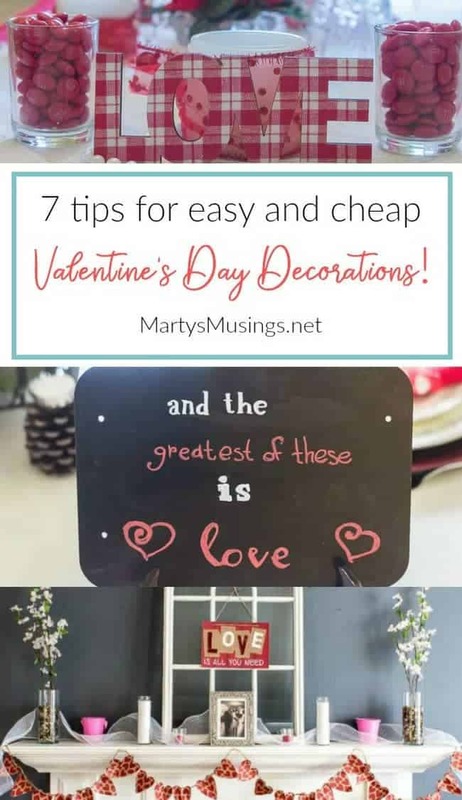 These 7 tips for easy and cheap Valentine’s Day decorations are items you already have in your home! With a couple of practical tips you’ll know how to pull it all together! Most marriages begin with a simple boy meets girl story. 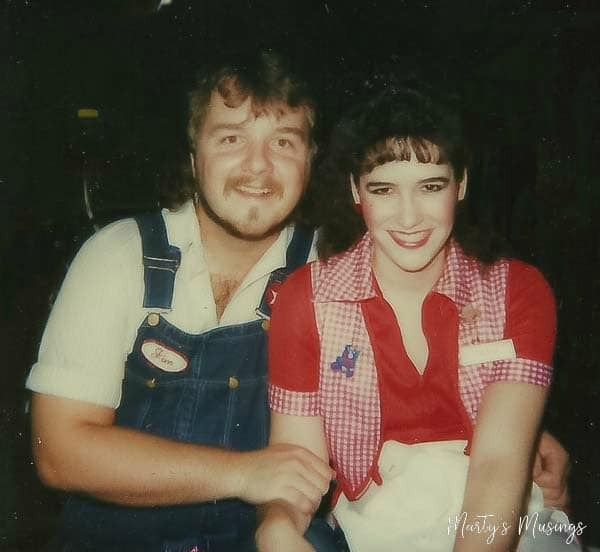 Our story begins on center stage of a dimly lit dinner theater in small town USA. Worn out blue jeans, long hair and fuzzy beard, the singing troubadour with the silky smooth voice crooning a love song instantly captures the girl’s attention. Whenever the girl replays the scene in her mind many years later she can’t remember the name of the song because it really doesn’t matter. It wasn’t about the lyrics or the tune. A magnetic presence drew her to him, wooing her heart when he didn’t even know she existed. Something magical happens in the theater amidst the lights and makeup and excitement of learning lines and melodies. Neither the boy nor the girl were strangers to a dreamy new love, but it would be their last. It would only take a few short months for him to capture her heart. 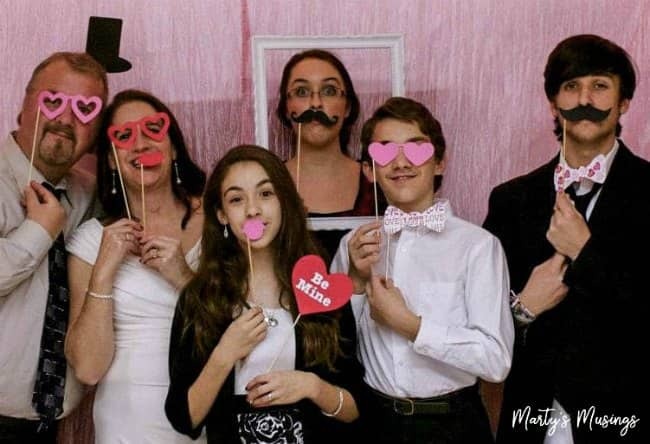 Boy and girl pledge their lives and true love for all eternity on Valentine’s Day, a fitting way to celebrate and commit before God the desire for a lasting relationship. The best love stories continue on with Act II, the middle years. These years seem interminably unending while enduring but pass in the blink of an eye when seen in retrospect. One baby, two, adoption + three more. Jobs, homeschooling, church, extracurricular activities, everyday life. Somehow the twists and turns in the drama pull the boy and girl apart, one moment, one day at a time. Every good drama has conflict and tension, moving the story forward, drawing the audience in. The boy and girl don’t know how to close the gap, the distance between. The love they pledged is still present, yet overshadowed by the demands of a life that is bigger and more demanding than either imagined. Then there is Act III. Those eyes that locked with hers over 30 years ago are the same hazel ones she looks into each day after a hard fought battle. Boy and girl choose to reach towards each other instead of push each other away. Rescuing their broken marriage from the edge of heartache has taken all the inner strength they possess. Wounded hearts need time to rebuild and fall in love again. Yet the same love they pledged before God is the love that now cherishes each day together. What does ACT IV hold? Boy and girl picture their future, walking into the sunset, hand in hand, much the way they began their journey. The stage may be smaller, but the same love that drew them together will continue to sustain them as they grow older. Life will continue to hold challenges, in different forms, but the love that “bears all things, believes all things, hopes all things, endures all things” (I Cor. 13:7) will shine the light on each day’s path. I know our story probably isn’t much different than yours and I want to encourage you today in both your marriage and your home. The most beautiful pieces of our broken lives are the ones that have been restored into something almost unrecognizably beautiful. And the same within our homes, what may look like trash off the side of the road to one person can be carefully transformed into a completely new work of art by the person who sees potential. Isn’t that just like our heart and our lives? 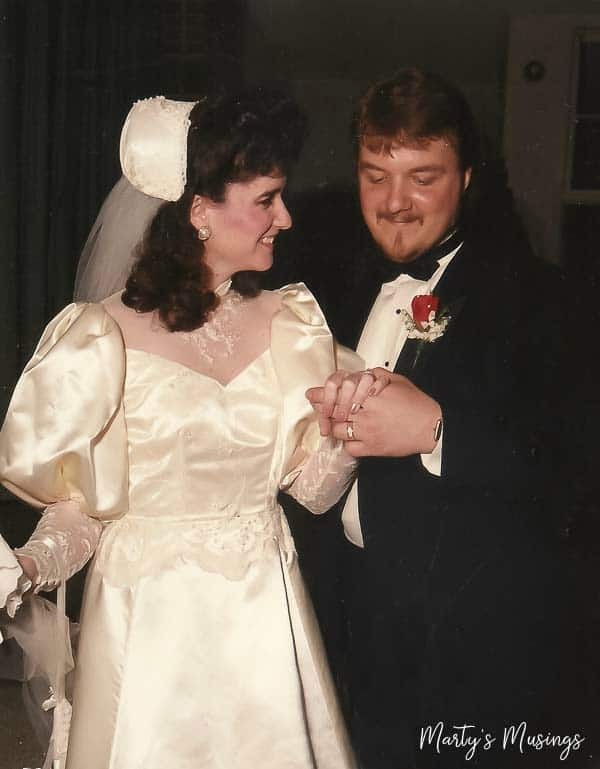 I couldn’t share my easy and cheap Valentine’s Day decorations without first sharing a simple love story from my husband and me on our Valentine’s Day anniversary! But since you know I love to share the ways I decorate my home for practically nothing here’s how I do it for one of my favorite holidays! 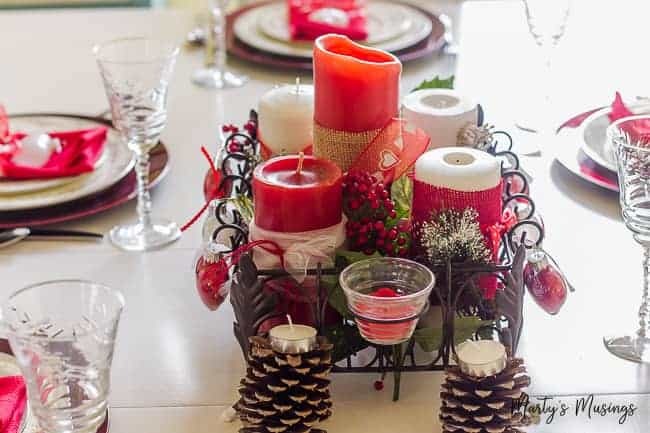 Pink and red are the go to colors for this holiday so add a few touches to your home. 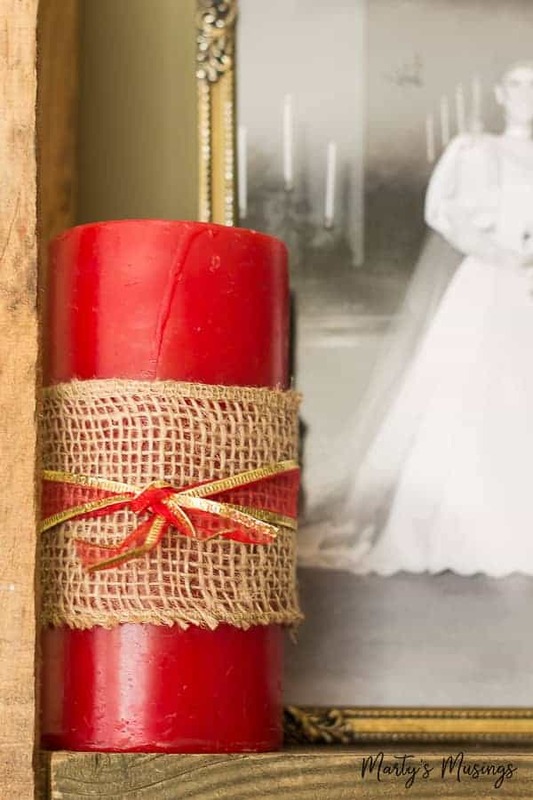 Even easier, save a few ornaments from Christmas and stash them in a large glass mason jar! 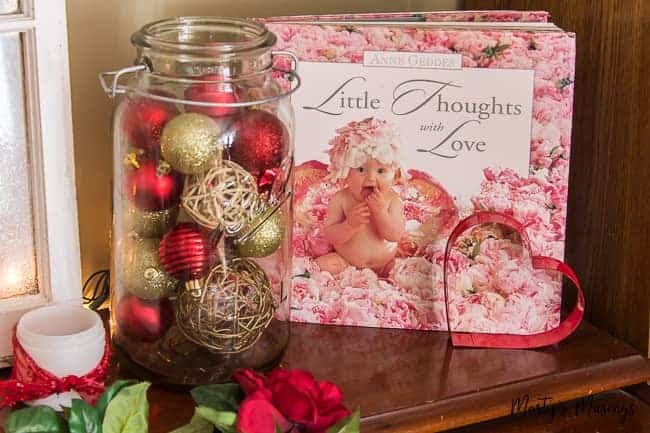 I added a book on love and a cookie cutter for a cute mantel. 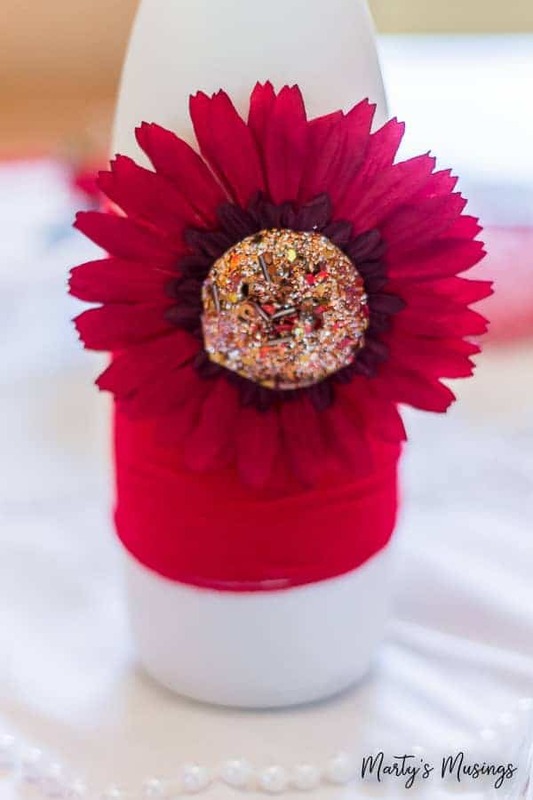 How about spraying painting a bottle white, wrapping a bit of red thread around it and adding a cheap accent from a craft store. This one was on sale after the holidays for a quarter. Love it! 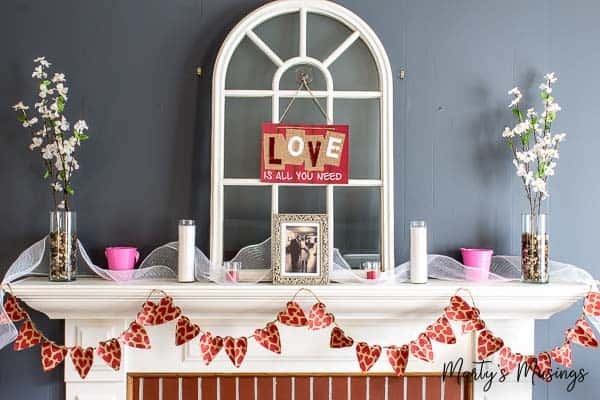 Last year I made a simple heart banner out of gift bags from the dollar store and used on a mantel but you can hang it anywhere you want to add a little Valentine flavor. My love of old windows is evident with this grapevine heart wreath (another yard sale bargain). 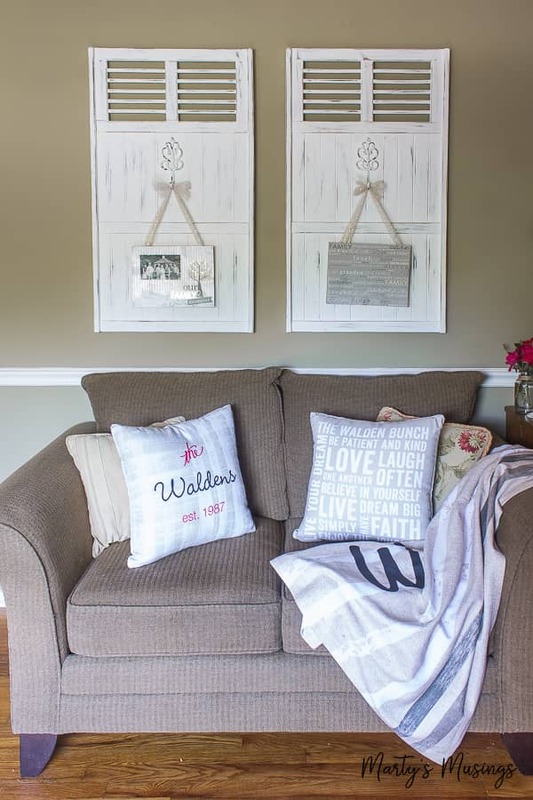 I love to change out scrapbook paper in a simple white frame for the seasons to use in my home decor. Fill small glass jars with red M&M’s for a cute table accent beside this inexpensive wooden craft sign. 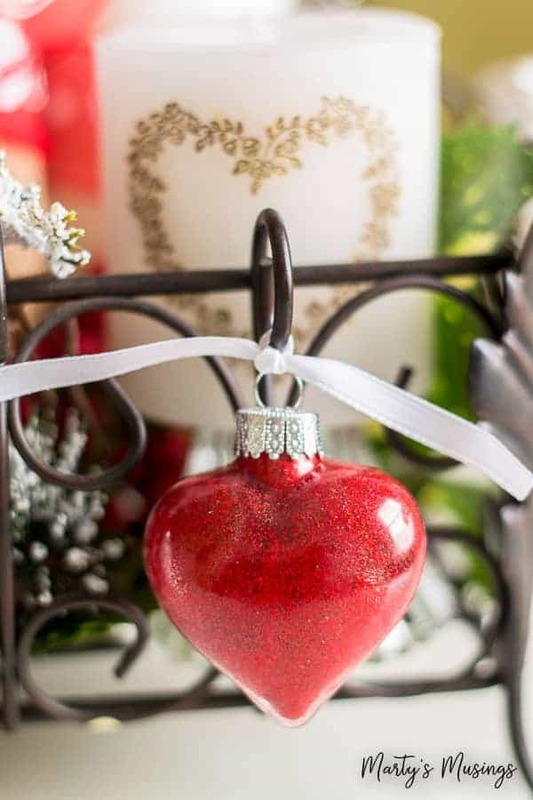 I found these clear glass hearts and used my recipe for no mess glitter ornaments from Christmas to make some for Valentine’s Day. 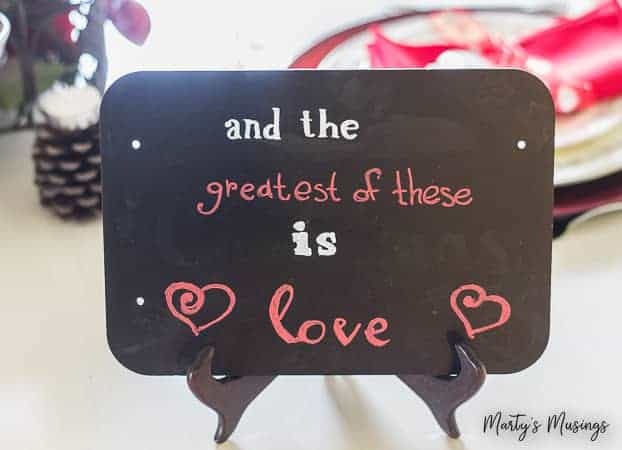 How about a simple chalkboard and a reminder of the greatest love? 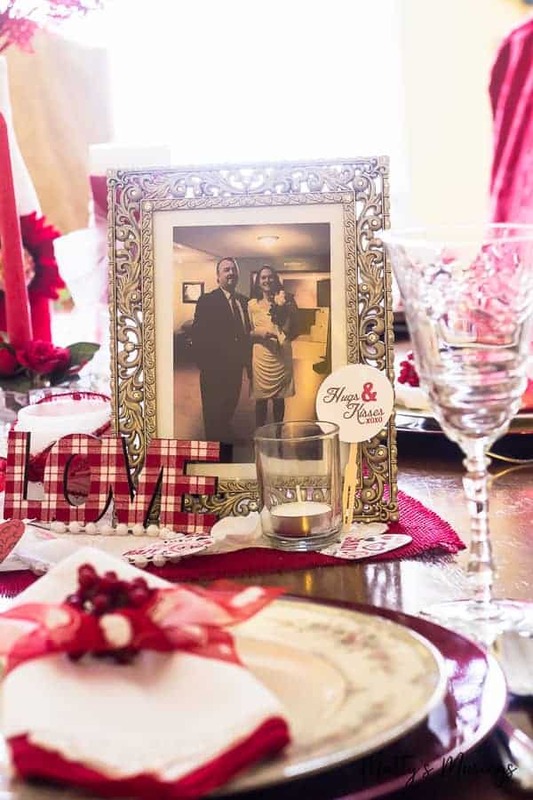 Even if your anniversary isn’t on Valentine’s Day like mine is, you can still add a favorite photo to your table or scatter them around your home where you can enjoy them. 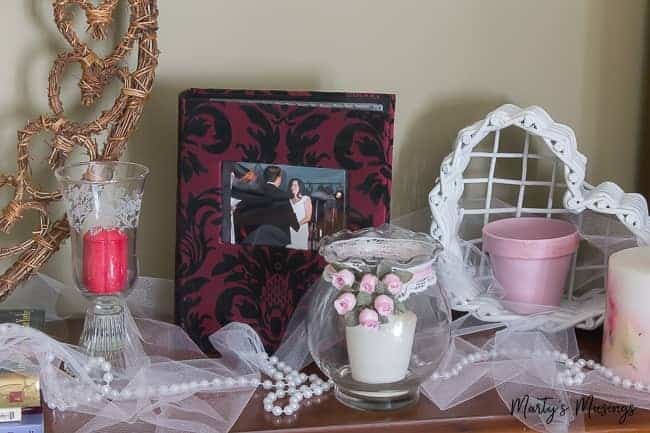 I made a small scrapbook album of pictures from our surprise 25th wedding anniversary vow renewal ceremony and then used it on my mantel! 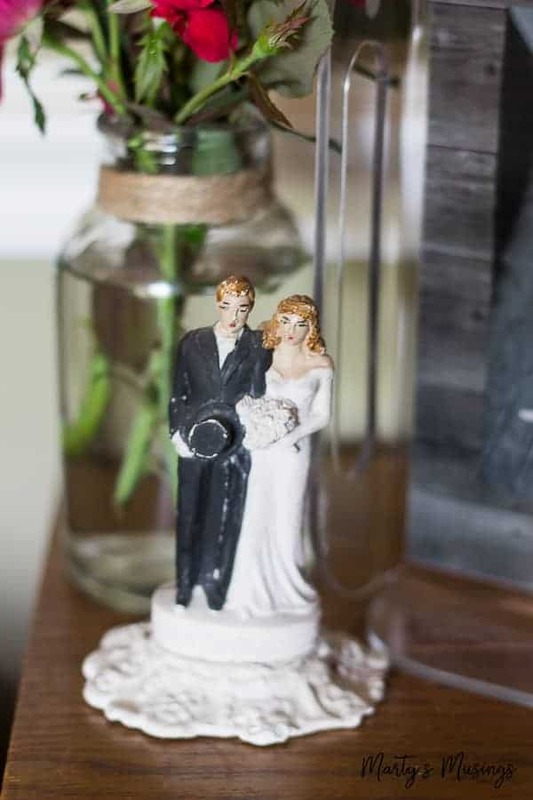 This vintage bride and groom holds great sentimental value for me as it was the cake topper for my parents wedding cake in 1944. Since they are no longer living I treasure the memories it brings me and the celebration of 64 years of marriage. 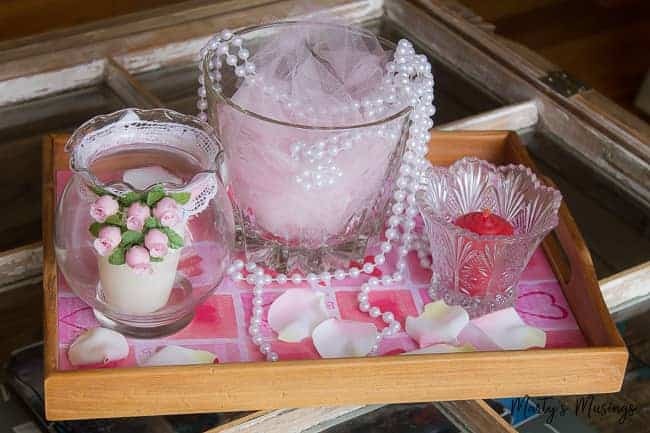 Sometimes all you need is to add a little bit of “fancy” to a wooden tray to bring out the essence of the holiday. Most of this little vignette was recycled from my oldest daughter’s 16th birthday party (she’s now 29 with two kids of her own!) and my parents 60th wedding anniversary. I really don’t have a huge stash of crafts or a large home, I promise! I only save things I know I can use in my own home later on. 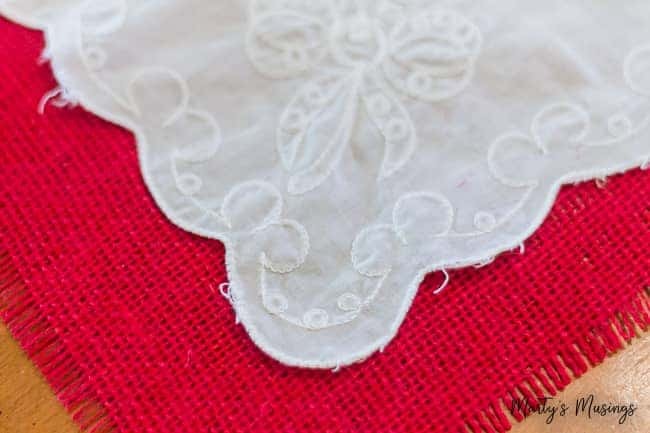 A red burlap runner with vintage white fabric are a perfect combination for any table. Spearking of tables, our kitchen table is my favorite place to decorate for the seasons. 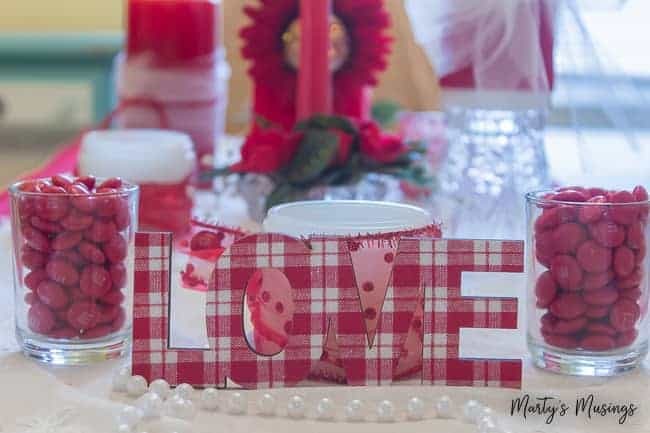 This easy Valentine’s Day centerpiece was created by using natural elements such as pine cones and berries with fabric wrapped candles and ribbon. 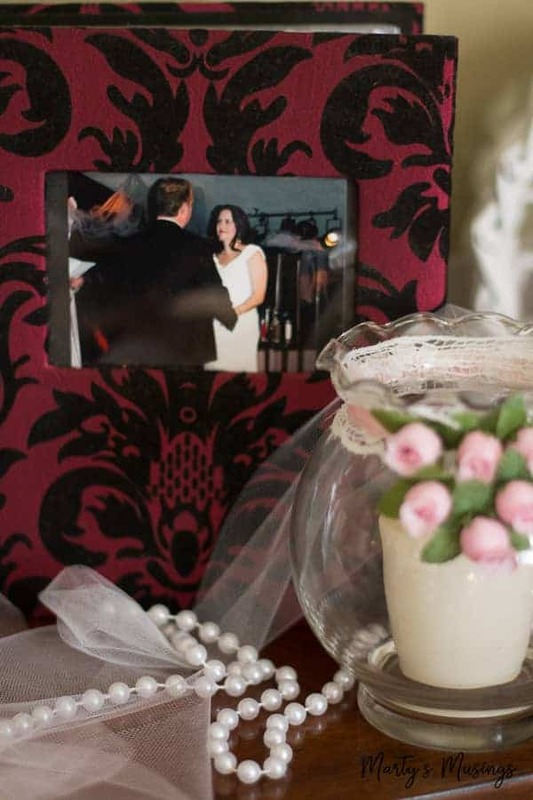 Combined with my wedding china and my mom’s crystal the table has an elegant yet rustic feel. 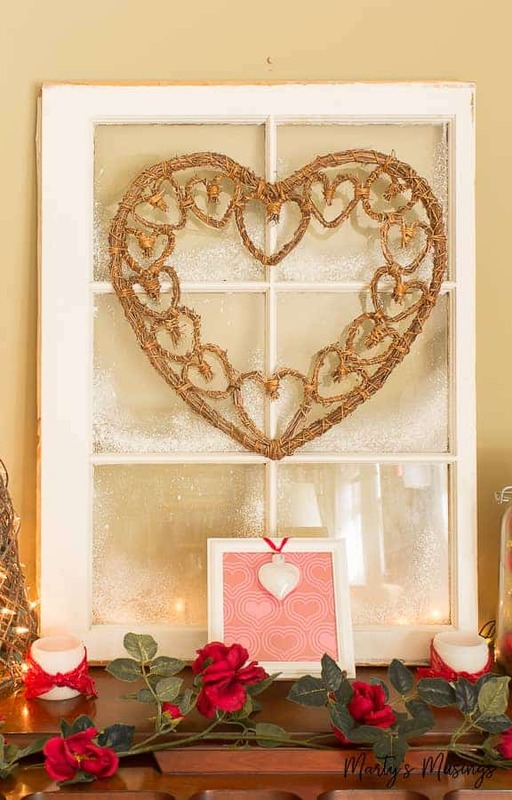 If you want a more casual table, just cut out hearts from scrapbook paper, scatter them about and add a few candles. Simple and festive! 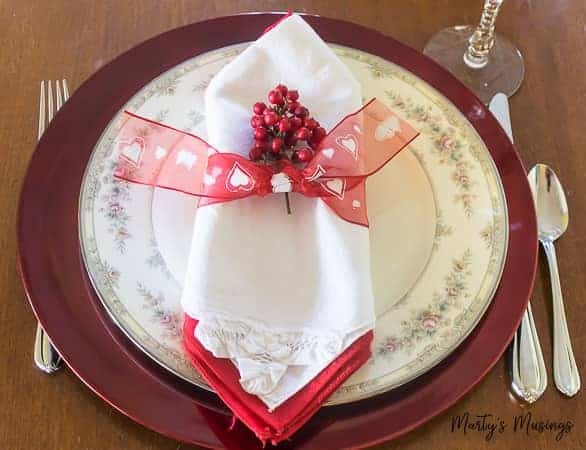 A few berries tucked into a bit of heart ribbon adds a lovely touch to a place setting. As always, remember why you celebrate the holiday! Enjoy the family and friends that God has blessed you with. Need some more ideas? 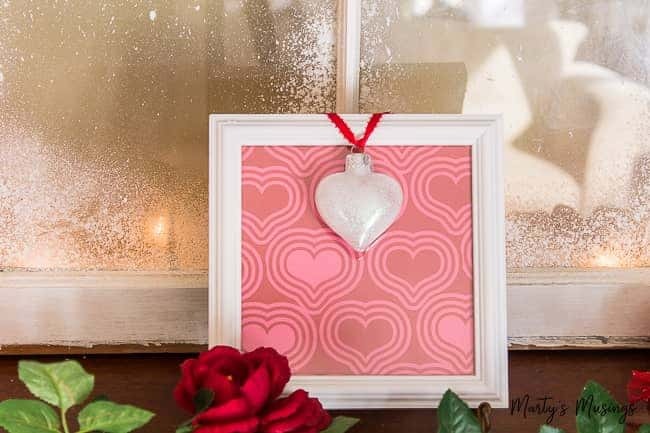 Here are 25 Valentine’s Day crafts and recipes to get you started! 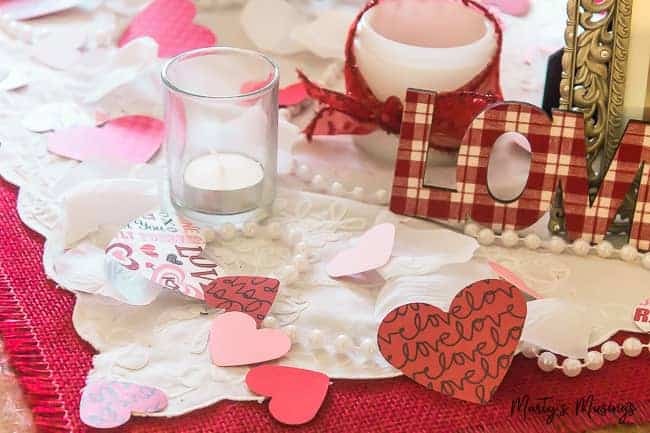 What are YOUR favorite easy and cheap Valentine’s Day decorations?